Active from 2007 – 2013, AND Eccentric Agent was comprised of Ikuma (vocals), Kili (guitar), PECO (guitar), Ken (bass) and KAJI (drums). 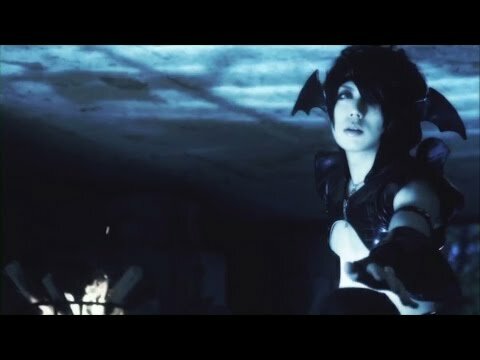 A visual kei band formed with the concept “(nostalgia and resonance) sympathy & nostalgia”, a notion embodied well in the PV for Muyuu no Kago, released in 2012. The quick cuts from the indoors to outside in autumn can be taken as merely interpreting the song’s lyrics. On closer inspection, the imagery presented can be reviewed beyond simple interpretation of the lyrics to the song. The setting is seen in two states – the deteriorated, dimly-lit room that houses the doll, dismembered parts, pictures & box bound with string, and the burned-out husk that we see the band performing in. As in the lyric in the first verse, “the door unopened remains closed / there is no opening”, this disheveled dwelling houses the relationship now tainted, in all tenses. The doll on the throne and the assortment of pieces represent the lover in the present, doomed to destruction by the betrayal of replacing Ikuma. The pictures of mother and child stand in for the imagined future with the lover, and the chair housing the doll seems to be a makeshift throne, indicative of the pedestal Ikuma has kept the lover on. The bound box houses the past, memories too painful to now revisit. The violence towards the doll, the removal of the eyes from the images and the incineration of the dwelling as the video concludes all indicate the killing of the lover in the lyrics, in a figurative sense. The lines “it was clear, those days won’t come again / because the thing you lose isn’t me” would seem to point to the end of the lover’s life. However, as the past, present and future are symbolized in the contents of the room, the loss referenced is one of the experiences and hope for a happy future together. The portraits present in the house appear to reflect a more maternal figure than referenced in the lyrics, which may indicate an oedipal complex – is Ikuma in love with his mother? Rather than accepting this surface reflection, it seems these pictures are the life dreamed of, the hope of life with a partner and starting a family. “In that unending night, stay without noticing and painfully, painfully close the door/ looking into eternity, in the dream the puppet’s wish doesn’t come true” near the end of the song points to this. The child in the pictures exists only in the mind’s eye, now part of an aborted future. Dolls in jars call to mind ‘pickled punks’ of sideshow attractions of days gone by, often malformed, unborn or stillborn foetuses preserved in formaldehyde and put on display. Dating back as far as the 1500s as novelties kept by nobility, they were popular in traveling freak shows of the mid 1900s. As the house seems to represent the now, then and what-if of the relationship, these symbolic punks could be seen as representing children lost during the relationship, or further stand-ins for the wished-for family. The fact that they exist in jars seems to indicate the former, as the photographs point towards the hoped-for future. Drooling milk could be taken oedipally, as milk and mothers are closely associated, but instead this sequence shows Ikuma quite literally choking up the ‘milk of human kindness’. The origin of the idiom goes back to Shakespeare’s Macbeth, and the depiction here indicates more than descent into madness. That he’s not drooling saliva, but rather this liquid of life, he’s rejecting the comfort one finds in relating to another. This violent regurgitation rejects the kindness once shown by the lover. As early in the song a replacement is mentioned, the eye plucked and presented to the doll could indicate the eye of the adulterous lover has been cast out, while in actuality it would appear the portraits showing the deadened right eye depicts this disfigurement. The lyrics “Goodnight to beloved me still etched in those fleeting eyes / instead of those eyes, I’ll embed a look of repose and put you to sleep” support this reading of the vandalized images. Another lyric elaborates on this point – “My transparent expectation reflected in that eye / won’t allow the other reflected thing / Because I don’t want to lose myself forever / I want to extract it”. The eye reflects Ikuma’s right eye color, and he’s bestowing his dreams of tomorrow to the former lover before destroying it all. It’s seen a future now offensive in the wake of her betrayal unable to look away from this perfect vision, cast out to no longer contaminate the whole. As Ikuma’s look often incorporates two light eyes, the fact that it’s his right eye here is a strong indication of this biblical symbolism at play. Burning down the house sets the stage for a further reference to hell. “The hands of the crying clock stop and I fall deep and dark forever / the distant memory I yearn for is gone, wrapped in lifeless ashes” – time ceases for Ikuma in his descent, and his passion burns the dream to the point of extinction, creating the incinerated, ashen remains of the structure that the band performs in. This is a later work by the band, and plays to the concept of the group rather fully. Indicative of a comprehensive creative vision, the imagery serves to further the lyrics, and the duality of the setting creates a strong sense of the emotional turmoil embodied in the piece. Ikuma’s current work with REIGN will surely be a compelling view from a place of internal torment worthy of close attention. Get your copy at YESASIA!